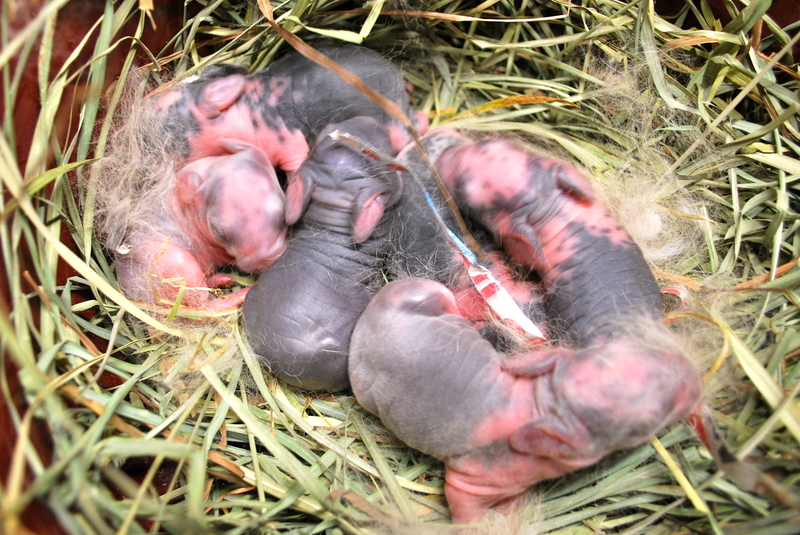 For the first time ever we have broken rabbits here at Abernathy’s! Broken of course refers to a spotted coat color. So far we have had nothing but solids, otters and agoutis born here. Today, my new pedigreed Standard Rex doe Opal (who is coincidentally also an opal color) kindled her first litter sired by my new broken buck, Pine Tar. She was a day late and kindled on day 32, and my other Rex doe Bluefin, who was bred at the same time to the same buck is also late and will probably kindle tonight. Can’t wait to see what she’s going to throw! These little bunnies are just so gorgeous! There were six smaller-sized kits born in the nestbox this evening. Originally Opal had decided to move the location of her nest to the cage floor, and relocated all the nesting material there. I stuffed it all back into the nestbox the next day and she seemed fine with that, pulled fur and had her babies where she was supposed to. Since this is my first experience breeding her, it’s good to see she’s a sensible rabbit. There seems to be some broken opals, broken castors, and a solid castor. These are really just guesses though based on the colors of the parents. I can’t wait to watch them grow out! The little spotty coat patterns look so beautiful when they’re tiny like this, like how a shrinky dink looks better once it’s been shrunk. I’m sure they’ll make very attractive adults too, but their patterns look so intricate and perfect at this age. 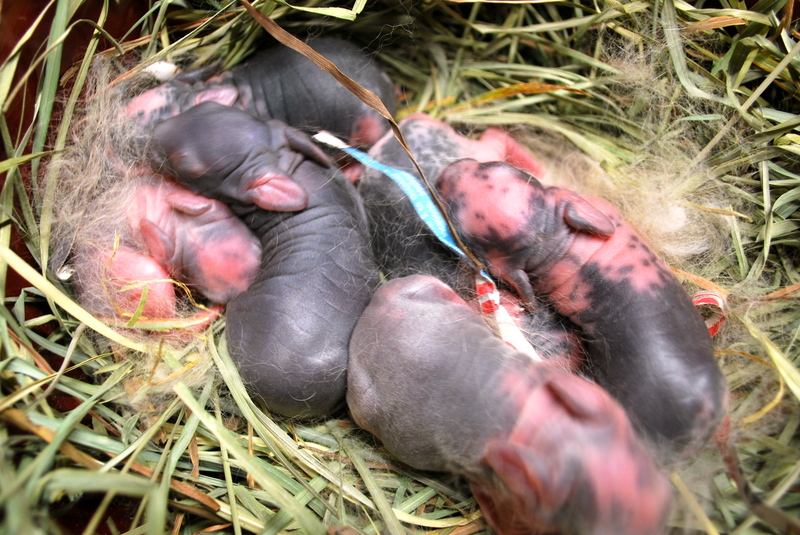 Another first here at the rabbitry is that these six little kits are the first fully pedigreed and papered rabbits to be born here! Yay! 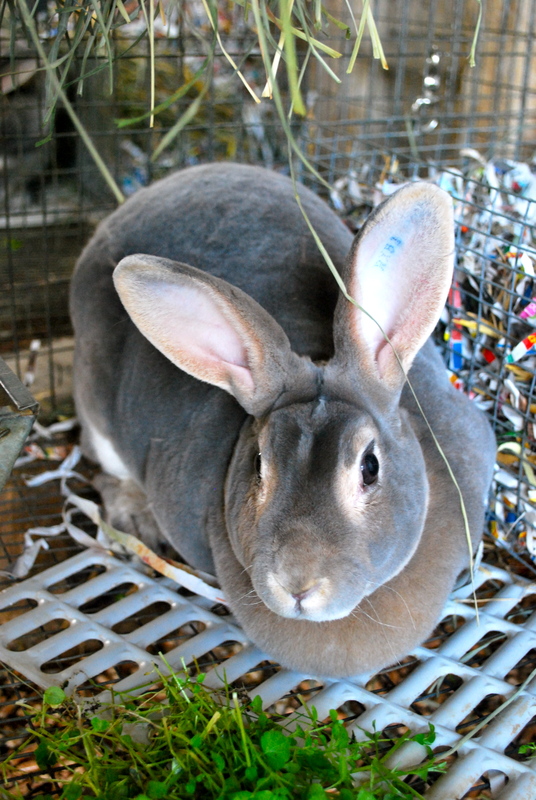 Both parents are from a very reputable local rabbitry and were specially selected to make a good breeding match based on their background genetics. Here’s to lots more fully-pedigreed buns! Aww! 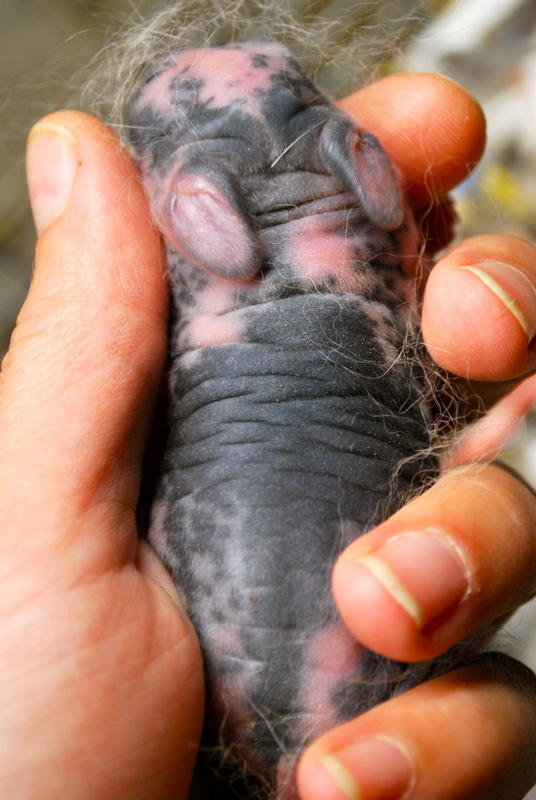 We hope to breed rabbits soon- how old do they have to be before you can hold them? They must be at least one second old before you can hold them. Nope! I always handle them right away to count them and remove any that may be dead. I’ve never had a problem.